Due to some other priorities, I couldn't work as fast as I wished on Brothers In Games. However, I couldn't leave you with just a list of the tournaments you could have added as favorites. So, I released an update with the first set of details. Tournament details for the Preview 6 of BIG. As you can see from the screen capture above, the detail view currently displays some basic informations. 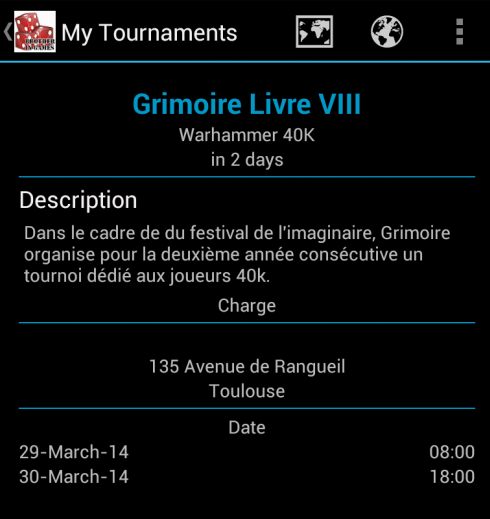 The description is from TableTop Tournaments, so it is in the language of the event organiser (here, in french). From there, you can jump to the web page for more details. In the next days, I will add the location information (I have to work on the layout) and of course, you'll be able to locate the tournament on a map just as with Brothers In Games T3. I also plan to provide an add to calendar feature, but it is a little bit tricky as I want you to be informed if the event is already in your calendar or not. I am currently publishing an update for Brothers In Games and Brothers In Games T3. Both of them should be available as soon as Google will spread them trough their servers. Those updates introduce the new tournaments management feature. 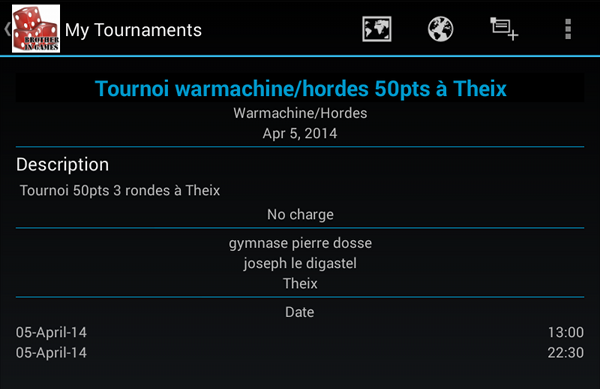 Brothers In Games T3 is designed as a tournaments discovery app. 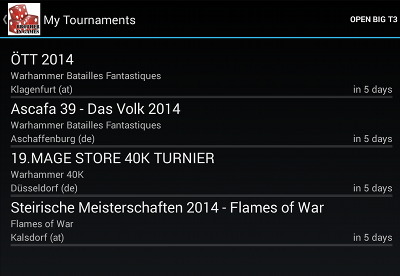 By design, the app does give you a list of the upcoming tournaments registered on TableTop Tournaments, but it is not designed to mark some of them as favorites or give you a quick-access to them. 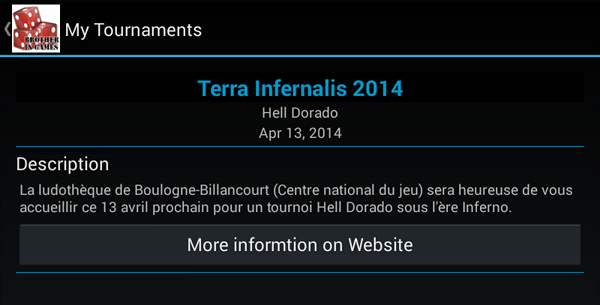 So, the features like the map location are meant to help you decide if you are interested in a tournament. 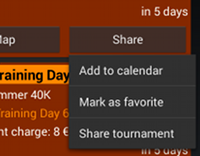 The only way the app may help you to keep track of the tournament is by registering the tournament as an event in your calendar. Dealing with favorite tournaments like events is the minimum we can do. As a gamer, I want to attach more informations to such an event. I want to plan some things (like what army will I play ? Did I painted it ? ) and maybe record informations such my ranking. This features are meant to be in Brothers In Games. If you already use the app, you can already keep a track of simple games. This feature was a preview for the bigger one, the tournaments. Adding those features is time consuming, but I decided to publish the apps with the minimal feature so you can have a look to what the app will be able. I also plan to continuously the new features rather than a big update. So starting with the version 1.8 of Brothers In Games T3, you can register a tournament as a favorite. This feature is for now in the Share menu as you can see on the picture on the right. Once you'll have selected that option, the app will gather all the information about the tournament and send it to the Brothers In Games app. Of course, the system will check first if the app is available and if not, will suggest you to get it from the Play Store. The tournament will be automatically added to your tournaments list in the Brothers In Games app unless it is considered as a duplicate. Keep an eye on the next updates.